Currently ECWolf does not implement the entirety of the new format, and no editor is directly capable of creating it. 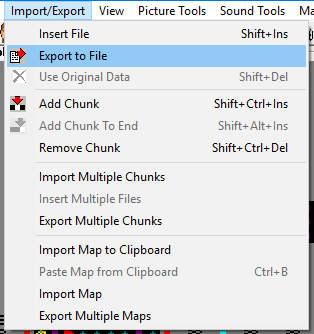 Maps can be created by using the export feature present in WDC and HWE. I don't seem to have that export feature in WDC. Don't have my Windows machine at the moment to find it myself, but the latest version of WDC 1.17.393 that was just released has a fix related to WAD/PK3 export so it's definitely in there somewhere. There's still some TODOs I have to get through like sound zones. What exactly does HOLOWALL mean for UWMF? Make a copy of the tile definition for the map spot, turn off all the blocking flags, and use it at that location? Is Change Trigger supposed to remove the trigger it's mutating or just disable the activation on a particular side? The ECWolf code just seems to disable the activation, but the resulting trigger list in UWMF looks a bit weird. What exactly happens when fillzone is disabled for a modzone? Fill in -1 for that tile? Tags would never show up in a translated map, right? Somebody at work was wondering about Corridor 7. Does it use normal GAMEMAPS format? Is it possible to write a XLAT to convert the maps? In vanilla the behavior is if you're standing in the "floor code" (zone) then the exit switch takes you to the secret exit. So if you had an exit switch accessible from both sides one would be secret the other would be normal. It works as a normal zone. Tags can show up in a map which uses 4 planes or ROTT RTL maps. The 4th plane is a bit complex (since everything in ROTT seems arbitrary), but the part that ECWolf supports is simple. In the 4th plane you put at the trigger location 0xXXYY which is the coordinates of the activation site (switch or "touch plate"). In UWMF the role of tags is reversed, but ultimately they're interchangeable since you can have multiple triggers in one location. You need to translate that to having the trigger at the activation site pointing to the location of what you want to affect. See the code after "// Install triggers" in gamemap_planes.cpp. It's the same binary format, but off hand I don't know how much of it can be translated. Over time I'll be capturing the feature sets of all the commercial games. It's unlikely that UWMF is missing a way to express something, but ECWolf might not have all the features needed (trigger types specifically). OK, I guess my implementation is correct. The concept seemed odd and I wasn't sure if it was intended that the old trigger could still be activated from other sides. It has been awhile since I looked at the C7 maps, but I do recall them being pretty vanilla (compared to say Blake Stone). Translating the layout of the maps shouldn't be hard. Wall codes and zones should be similarly organized. Once you start talking about the interactions with the map or actors things get really arbitrary. In the Wolf 3D XLAT, there are a few Door_Open templates with arg3=3 (96 is one of them). Are these supposed to be 101 (both keys)? No, doors for two more keys exist in vanilla. The only thing missing is an actual way to get those keys so ECWolf implements accordingly. Huh. I ran into this when trying to convert Renovation map 21 which uses some of those tiles. That map also has 11 unknown things, all of which seem to be buried inside of walls. I tried loading the map in WDC but it doesn't know what they are either. To actually properly use those tile types in ECWolf you would have to define two more keys in LOCKDEFS, wouldn't you? That is correct. Adding two more keys was a popular source mod (probably due to how easy it was), but I think I've heard of mods doing either/both keys so it's going to be a matter of figuring out what the intention was in the original and adding the matching LOCKDEFS and if necessary new actors. As far as I can tell this level set was made in 1994 so there shouldn't be any weird stuff going on with it... I'll ask the guy who converted if he can figure out what's going on. Text map created using information from this page http://maniacsvault.net/ecwolf/wiki/Uni ... Map_Format could not be loaded in ECWolf. As far as I understand, correct map format should contain some binary part at the beginning and at the end of file? Is there some information on how to build those binary parts? Also, I would be very grateful to have one small map in UWMF format which has one or two walls somewhere and player start mark which is loaded in ECWolf properly as an example. There's not strictly speaking a binary component to the maps. They are contained in wad files though which might be what you're referring to. WDC 1.18 can export maps in UWMF format which can be used as an example. Alternatively if you upload your attempt I can tell you what you're doing wrong. My test map is attached. When I try to open this map in ECWolf it does not load it and loads default level instead. I have attached screenshots of what I see when I try to export map in UWMF. Export button is always disabled.